Tourtière or ‘New Years Meatpie’. Photo by James LaForest. My husband is of French Canadian origin and grew up in a bilingual household. Though my French is strictly high-school French, I have my own French Canadian roots – my maternal grandfather was French Canadian, and I am still trying to track down his mother’s (possibly Native American) ancestry. Back in the late 1970s and early 1980s, I devoted some time and effort to learning more about our French Canadian heritage (a laborious task in those pre-internet days). I was particularly interested in French Canadian cuisine, and in fact a couple of old Jehane Benoît cookbooks still grace my bookshelves. I was also working as a freelance writer at the time and drafted but for some reason never submitted an article on the topic. In the interim, I have become a vegetarian and moved on to a different kind of cooking. But in the spirit of “never too late!” I here present a few old favorites for your delectation, along with an excerpt from the narrative I wrote to accompany them. These recipes have all been kitchen-tested, though not for nearly forty years! 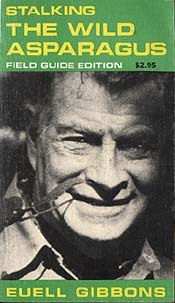 I once found myself (long story) in the position of having to prepare a meal for Euell Gibbons, author of Stalking the Wild Asparagus and many other books. What do you cook for a well-known expert on edible wild plants? I wasn’t about to gather acorns and pluck day lilies from my back yard in an attempt to compete with him in his own arena. On the other hand, I wished to spare him yet another variation on the usual dinner party theme. This was a man, after all, who specialized in the esoteric, at least in matters culinary. I finally settled on French Canadian food – tourtière with all the fixin’s. It turned out to be a happy choice. He professed great delight, and the gusto with which he helped himself to seconds and thirds inclined me to absolve him of mere politeness. Like others before him, Gibbons discovered that French Canadian cooking, far from being just a half-baked version of French culinary art, is a distinctive and interesting cuisine in its own right. Pork is a menu mainstay, but if such lumberjack’s fare seems too heavy as a steady diet, you’ll find many delectable ways to prepare seafood and poultry as well. French Canadian cooking relies on subtle and delicate flavoring, so add spices with a light hand. Savory, little used in American cookery, is essential to the success of many French Canadian dishes. Habitant pea soup, thick and hearty enough to serve as a main course, must be made with whole yellow peas to be authentic. These are harder to come by than split peas, so if you find a source, stock up. Serve with crusty French bread. soaking water, plus enough additional water to make 2 qts. Clean and pick over peas, soak overnight. Place all ingredients in a large pot and bring to a boil. Reduce heat, cover, and simmer 3-4 hours, until creamy. Adjust seasonings. Add butter just before serving. A delicious and unusual way to prepare chicken. Brown chicken in oil and remove from pan. Saute onions, garlic, and celery. Stir in flour until well blended. Add cider, wine, and seasonings, stirring constantly until mixture thickens. Add chicken and potatoes, cover, and simmer 1-1 ¼ hours. 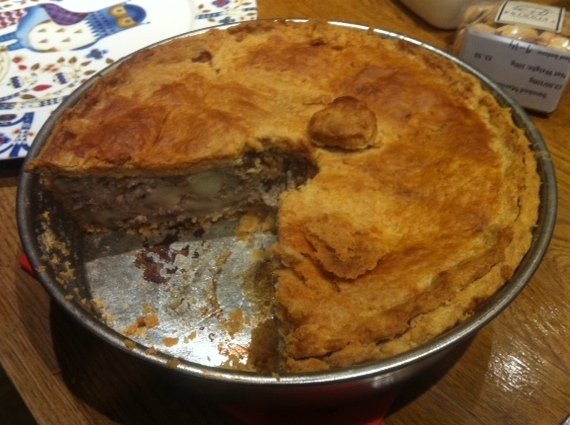 Tourtière, named for the pottery casserole or tourte in which it was originally baked, is traditional Christmas fare. It has been said that there are as many recipes for tourtière as there are cooks. Some recipes call for ground beef or veal as well as pork, others include potato or bread crumbs. My husband longingly recalled his beloved Mémère’s tourtière, but between the language barrier and her pinch-of-this, dash-of-that cooking style, I was unable to extract a recipe from her in the few short months I knew her. Here is the version I finally settled on – the one I served up to Euell Gibbons. Tourtière, by the way, freezes beautifully, so your holiday pies can be prepared a month or so in advance and reheated. Some cooks claim that this treatment actually improves the flavor. Tourtière may also be served cold. Saute onion, garlic, and celery in butter until golden brown. Add meat and continue cooking, stirring frequently to break up meat. Add spices and water to cover. Simmer slowly for several hours, adding more water when necessary. Mash in potato and place in double-crust pie. Prick top crust with fork and brush with beaten egg thinned with a little water. Bake for 10 minutes at 425°, reduce heat to 350°, and bake for another 40 minutes. There are many different maple syrup pies, both single and double crust, with either a clear or a creme filling. This one, among the simplest, dates from colonial times. Use Canadian syrup if you can—it’s guaranteed free of lead contamination. Don’t try this recipe with Aunt Jemima’s! Boil syrup and water for 5 minutes. Add cornstarch mixture, stirring constantly until filling thickens and becomes transparent. Add butter and chopped nuts and allow to cool. Pour into pie shell, add top crust, prick with fork, and bake at 400° for 30 minutes. Cindy Pomerleau is a Research Professor Emerita in the University of Michigan Department of Psychiatry, where she conducted research on smoking and nicotine addiction. She is the author of Life after Cigarettes. Copyright © 2014 Cindy Pomerleau. No duplication without permission.